ARE Series analog single phase chargers have many inherent advantages…voltage regulation, short circuit protection, low operating costs (a combination of high efficiency and high power factor), easy maintenance and high reliability. The ARE Series of analog single phase chargers combines these inherent advantages with advanced rectifier, control and filter circuitry, and user-oriented packaging. Designed specifically for utility and communication applications, the ARE Series analog single phase chargers are easily adjusted to meet your specific operating requirements and will provide years of low-maintenance service. All transformers are dual wound for either 120, 208, 240V (-12, +10 percent) or for 208, 240, 480V, single phase, 60Hz ±5%. DC voltage is maintained within ±0.5% at any load from no load to full load with ±10% variation (or ANSI standard ranges) in the AC input voltage while floating rated number of cells. Control is accomplished with a single control board with operation on or off a battery. During operation, the maximum output voltage transient does not exceed 5% of the initial steady-state voltage for sudden load changes between 20% and 100% of rated output. Recovery takes less than 200mS. Operation off the battery is stable under all conditions of line and load (within stated limits). Turn-on under all conditions of line and load has a “soft-start” characteristic without overshoot. For 24V and 48V models, the filtering provided produces a ripple level of less than 30mVrms with electrical noise less than 22dBrn with C message weighing on a type 3A noise measuring set when connected to a battery with an eight hour capacity rating of four times the rectifier current rating. For 130V models, the filtering provided produces a ripple level of less than 30mVrms when connected to a battery with an eight hour capacity rating of four times the rectifier current rating. The total dynamic response of the control circuitry permits all ARE rectifiers to operate as power supplies (at increased ripple levels) when the batteries are removed for service. The current limiting circuit is factory set at 110% of rated DC output but can be adjusted down to 90% and up to 125% for intermittent duty up to two hours. To accommodate different battery types, both the float and the equalize voltages are continuously adjustable (no taps) over the nominal voltage range (24V; 24-30V; 48V models; 48-60V; 130V models; 120-145V). All models can be equipped with a float voltage compensation circuit, which can be connected up to 10 feet from charger. The temperature compensation circuitry will correct both the float and equalize voltages by 2.0mV per degree F per cell [added for temperatures below 77F (25C) and subtracted for temperatures above 77F (25C)]. A two-pole shunt-trip AC circuit breaker is provided for input protection. A two-pole DC circuit breaker is provided in the output. 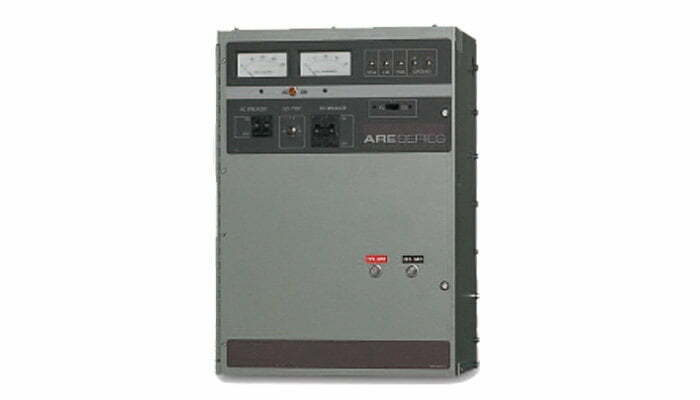 An AC power failure alarm relay provides Form C contacts, which operate in the event of an AC failure. All ARE rectifiers will operate at 110% of rated DC output, continuously in temperatures from 32F to 122F (0C to 50C). They can be safely stored for up to one year at temperatures ranging from -40F to 185F (-40C to +85C).